Abstract stain glass panel with patinated metal by Jacques Le Chevalier (1896-1987). Special commission for Societé Bobson, Paris 1965. It won the prize for Best 20th century piece this year at Pad. Galerie Jacques Lacoste, Paris. Image courtesy of Jacques Lacoste Gallery. 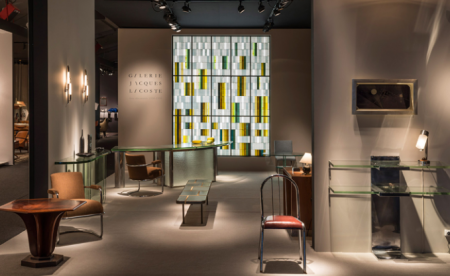 This week we’ve been at PAD Paris which celebrated its 20th anniversary year in grand style. There were spectacular pieces to see, beautifully curated stands and a wide variety of contemporary and more historic works. With predominantly French galleries exhibiting, there were a few foreign galleries present. Here are a few of the pieces we especially loved. 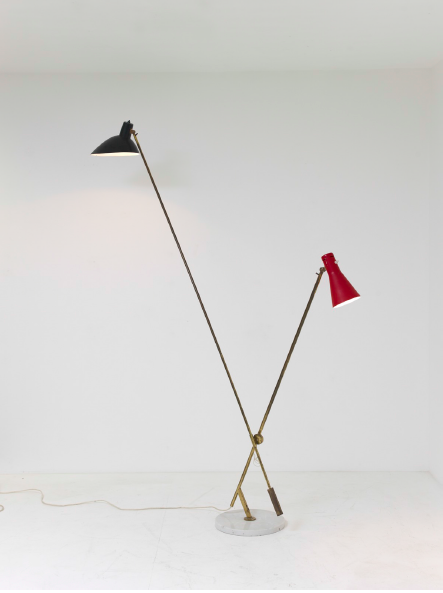 Rare standing light ‘1049’, 1951-1952 by Vittoriano Vigano and Gino Sarfatti, Kreo Gallery. Image courtesy of Kreo Gallery. 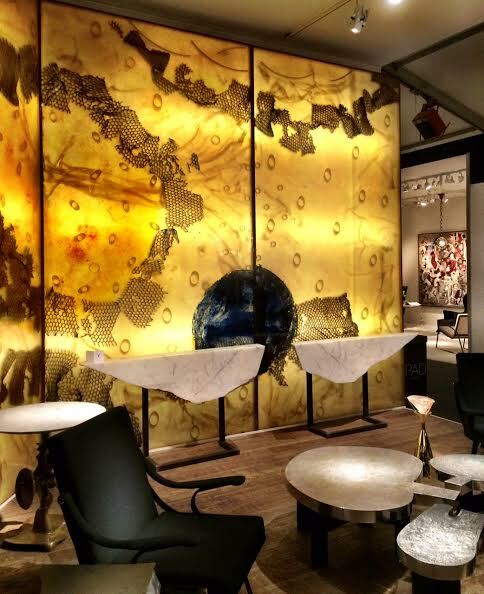 Kreo Gallery exhibit at PAD London and we were delighted to see them this year at PAD Paris. They showed a fabulous selection of iconic lighting from the 1950s. This rare standing light by Vittoriano Vigano and Gino Sarfatti is tall and imposing, the dual colors of red and black adding a dynamism and energy that is palpable. 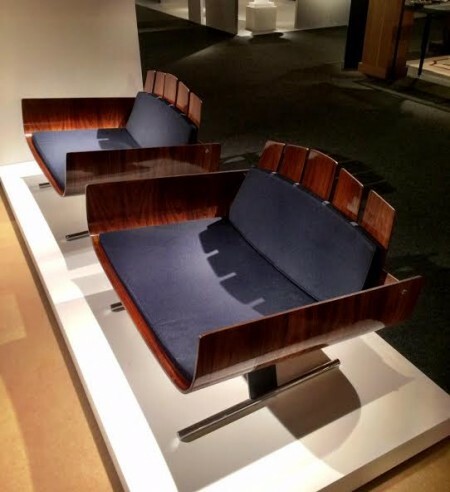 ‘Elizabeth’ chairs and tabouret, Kofred Larsen, 1956, Modernity Gallery, Sweden. Image courtesy of Modernity Gallery. 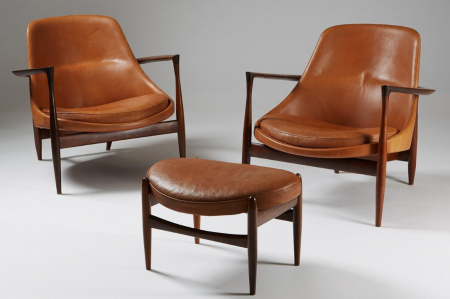 A pair of these chairs, in rosewood and original leather, was bought by Queen Elizabeth II and Prince Philip on a visit to Stockholm many years ago – hence the name! The buttery caramel leather and rich rosewood, so characteristic of Scandinavian furniture of this period, speaks to the aesthete in us. Tete a tete chair by Alf Wallander for Giobbel’s workshop, 1900. Modernity Gallery. Image courtesy of Modernity Gallery. 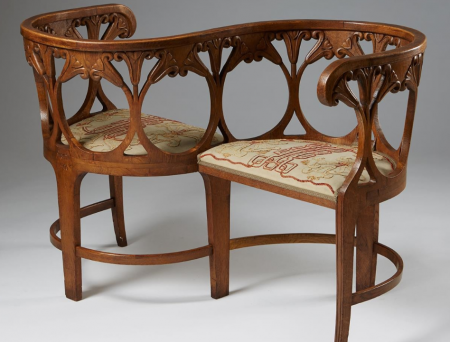 The exquisite forms of this beautiful chair are further enhanced by its touching history. It was a special commission for Carl A. Wahlin as a gift from his daughters Wera, Elsa, Orla and Aina December 8th 1900. The original tapestry seats were embroidered by the daughters to Alf Wallander’s sketch. The curving forms and masterful carving of the solid oak frame is echoed in the smooth line snaking along the base. Really special. 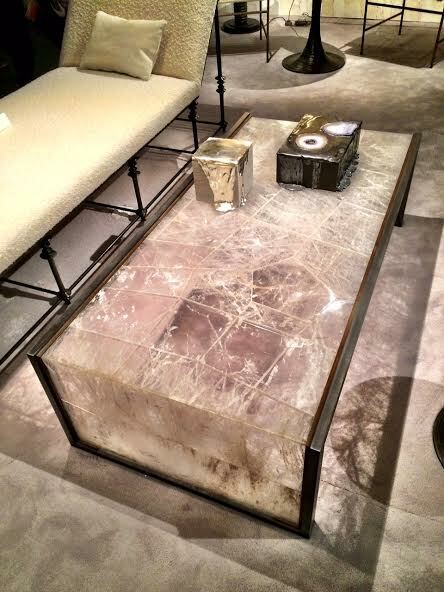 Large Quartz rock crystal ‘Waterfall’ table with steel frame. Chahan Galerie, Paris. Love the crystal, love the shadows it produces. ‘Supine’ desk in bronze 2013 by Charles Trevelyan, Carpenters Workshop Gallery. Image courtesy of Carpenters Workshop Gallery. Carpenters were showing the work of young Australian designer Charles Trevelyan. 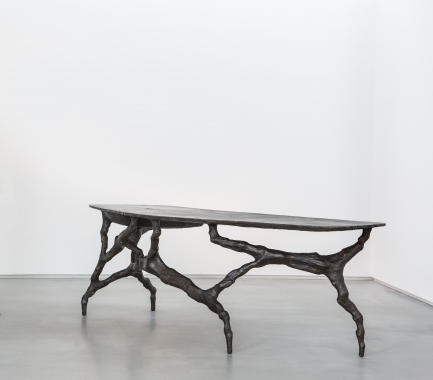 The elongated ethereal forms of this piece belie the massiveness of its solid patinated bronze. We loved the detail on the table top – a small discreet panel which opens where you store things, rather like a long ink well but more likely these days for computer plugs! 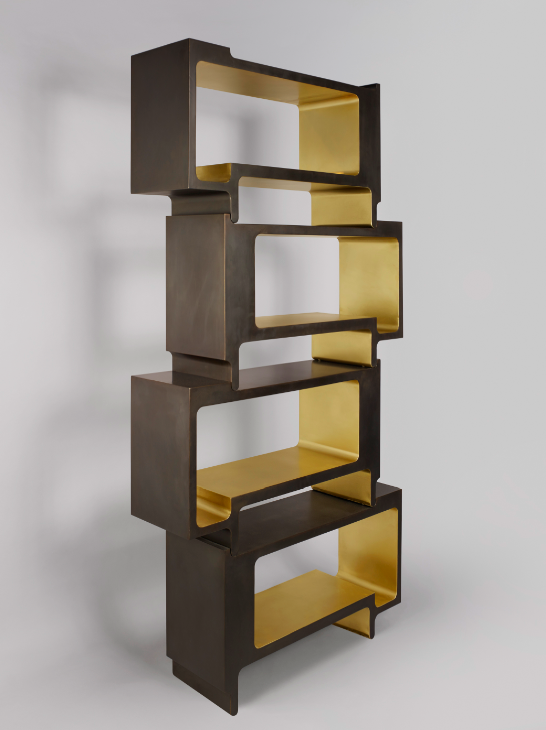 Xiangsheng shelving unit in brown oxidized bronze and brushed bronze 2016, BSL Galerie, Paris. Image courtesy of BSL Galerie. Design MVW (Chinese born designer Xu Ming and French architect Virginie Moriette) is a Shanghai-based design company whose work subtly connects contemporary Western and Eastern aesthetics. In the West a solid object is valued for its form and solidity while in Eastern Taoist philosophy, the void is charged with meaning as a space of contemplation and reflection. This theatrical ‘Mur lumineuse’ by François Chapuis stands 4 metres high and contrasts dramatically and superbly with the stark ‘Wing’ console with its chunks of roughly hewn white Aubert marble by Gerard Kuijpers. Chapuis was a renowned stain glass artisan responsible for the reconstruction of many French churches when he began his experiments in resin during the 1960s. 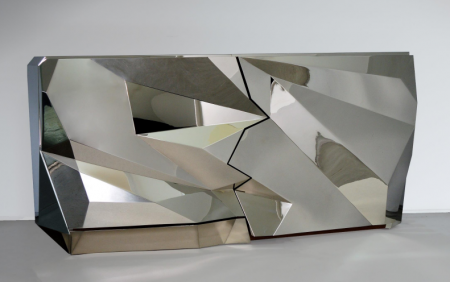 ‘Crystal’ commode in nickel plated metal and wood. Limited edition of 6. Garrido Gallery, Madrid. Image courtesy of Garrido Gallery. Second generation silversmiths, Juan and Palomo Garrido have taken up the mantel of their father, Master Silversmith Damien Garrido, in employing the traditional techniques while creating contemporary forms. With a reverence for the past and a great knowledge of the artisanal processes involved in the trade, they have moved resolutely forward to create spectacular pieces like the commode above. The play of light created by the contrasting surface planes is invigorating and pulses with energy. 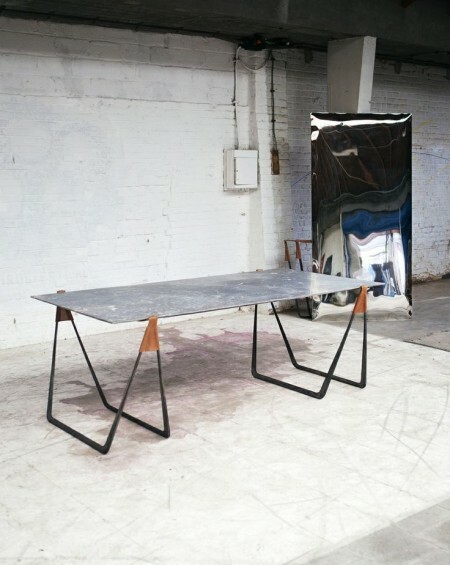 Invein table by Ben Storms, 2016. L’Eclaireur, Paris. Image courtesy of Ben Storms. At the opening evening of PAD we spoke to this exciting young artist, whose table won the PAD Prize this year for Best Contemporary Work. The design is brilliant. The surface of the table is grey Ardennes marble while the underside is polished mirror. When the table is not in use the top can be easily removed and placed against the wall as a mirror. We loved the leather incorporated into the design. Suspension copper light, 3D printed resin, and LEDs, 2014. Ilkka Suppanenen. Limited edition of 8 pieces + 4 AP. Galerie Maria Wettergren. Image courtesy of Maria Wettergren. 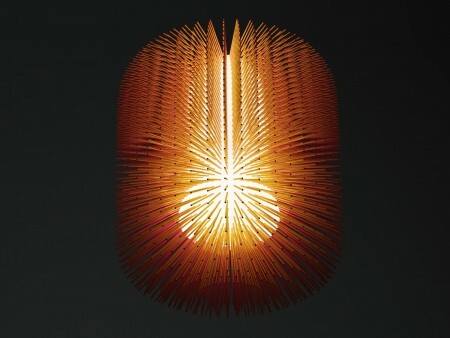 Spectacular suspension light created by Finnish designer, artist and architect, Ilkka Suppanenen.